The $80 million SGD Photonics Institute at NTU is funded and supported by industry partners and various national agencies, including A*STAR, DSO National Laboratories, the Economic Development Board Singapore, the Ministry of Education and the National Research Foundation, Prime Minister’s Office, Singapore. 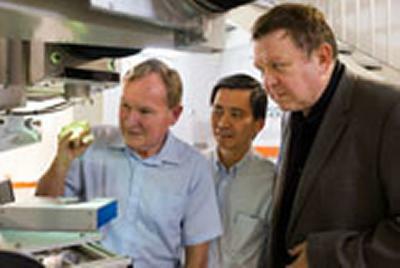 NTU President Prof Bertil Andersson said photonics is an enabling technology with applications that span many industry sectors, from communications to manufacturing, and even space technology. “We have already seen examples of how photonic technologies, such as optical fibres networks and lasers, have changed our society through the Internet,” Prof Andersson said. “Together with Southampton, our new institute aims to be become a focal point for photonics research in Singapore and to drive innovations on a global scale. University of Southampton Vice-Chancellor Prof Don Nutbeam said, “Our partnership with NTU is symbolic of Southampton’s strategy for internationalisation - working closely with world class universities to achieve mutual benefits in research, education and enterprise. The new institute will have a total of 120 scientists and staff from its five research centres, with a combined floor space of 4,000 square metres.